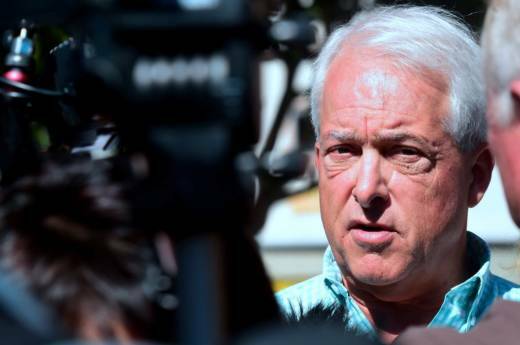 Throughout his campaign for governor, Republican John Cox and his allies have criticized Democratic opponents for affairs they had while in office, condemning their behavior as potentially attracting harmful exposure. He’s said voters should “judge someone based upon what they’ve done in the past.” But Cox has also faced accusations of marital infidelity, KQED and KPCC have learned. Details of an affair are alleged by Mr. Cox’s first wife in the court records of their divorce, which was filed in Illinois in 1997. KPCC and KQED obtained and reviewed more than 400 pages of documents from that case. Mr. Cox’s first wife, Nancy Cox, stated in a court filing that she discovered a home that she claimed he purchased to support another woman and her family while the two were still married. Ms. Cox wrote in that filing that the children told her about the other home in Longmeadow, Massachusetts, and that they’d met his girlfriend when they went to visit. The girlfriend is not identified in court records, and it’s unclear when their relationship first began. Ms. Cox also said that Mr. Cox wanted to remain married with the “understanding he would continue to maintain a relationship with the other woman in Massachusetts,” according to the court filings. Ms. Cox did not return several requests for comment. In court documents, Mr. Cox denied that the house was purchased to further an affair, stating it was purchased almost a year after the divorce was filed. The details of Mr. Cox’s alleged affair stand in contrast to the attacks he and allies mounted along the campaign trail. In an interview with KQED in September, Cox took aim at Democratic opponent Gavin Newsom’s past marital conduct. “If you conduct yourself in a way that exposes you to extortion or to blackmail... that’s really hurting the people you’re representing,” Cox said. Newsom admitted in 2007 to an affair with his appointments secretary, who also was married to his campaign manager. At the time, Newsom was separated from his first wife. Caroline Heldman, a politics professor at Occidental College, said most voters will forgive personal marital problems. But undecided voters could be turned off by the apparent hypocrisy of the Cox campaign. Cox attacked Newsom about his affair when he introduced himself to voters in a debate for Republican candidates hosted by the San Francisco Chronicle in February. As the primary election drew closer, a pro-Cox ad released in April targeted both Newsom and another candidate, Democrat Antonio Villaraigosa, for inappropriate relationships. While Villaraigosa was married to Corina Villaraigosa, he dated Telemundo television anchor Mirthala Salinas, and acknowledged the relationship in 2007, according to the Los Angeles Times. "I take full responsibility for my actions," Villaraigosa told reporters. The Cox campaign said they tried to pull the ad from the air — but not because of its content or tone. The campaign filed a cease-and-desist letter objecting to how the sponsors identified who had paid for it. Despite the letter, the ad continued to air for a week across the state on Fox News. Heldman said Cox clearly benefited. According to an aggregate of polling results during that time, Cox’s popularity increased by 13 percent in that period. He remained evasive when asked about his own marital record, turning the discussion instead to issues affecting the state. Mr. Cox gave that response at a campaign event on Skid Row in Los Angeles this week. He walked away without answering additional questions. His campaign manager wouldn’t address Ms. Cox’s claim that her husband wanted to stay married to her while he continued another relationship. Additional reporting by KQED's Michelle Wiley and Sonja Hutson.